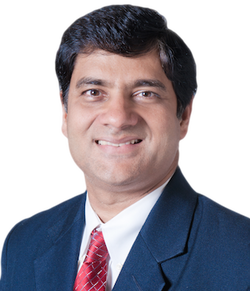 LASIK surgeon Dr. Surendra Basti is a fellowship-trained specialist in Refractive, Corneal and Cataract Surgery and is a Professor of Ophthalmology at Northwestern University Feinberg School of Medicine. Dr. Basti graduated from medical school in Mangalore, India in 1988 and practiced for five years on the faculty of the L V Prasad Eye Institute in Hyderabad, India as a fellowship-trained cornea and refractive surgeon. In 1998, he immigrated to the United States and completed internship training followed by ophthalmology residency at the Department of Ophthalmology, Northwestern University, where he graduated in July 2003. He thereafter completed a one-year fellowship in Refractive, Corneal and Cataract surgery at the Baylor College of Medicine in Houston, Texas. In 2004, Dr. Basti joined the full time faculty in the Department of Ophthalmology at Northwestern University Feinberg School of Medicine. Dr. Basti has performed laser refractive surgery since 1996. He has authored 85 publications in peer-reviewed ophthalmology journals. He has researched extensively and has considerable experience in treating patients with recent state-of-the-art refractive technology such as Intralase femtosecond laser and Wavefront-guided custom laser. At annual meetings of the American Society of Cataract and Refractive Surgery, his work in LASIK has received best paper awards and he has lead teaching courses for practicing surgeons from all over the world on LASIK with femtosecond laser as well as managing complex situations pertaining to LASIK surgery. In 2007, Dr. Basti was named to the list of the “Best Doctors in America” and has been named to this list each year since. In 2008, he received the “Achievement award” from the American Academy of Ophthalmology and in 2015 was selected to receive the "Senior Achievement award." His academic profile is also cited in Marquis Who’s Who in Medicine and Healthcare (Reed Elsevier Inc., New Providence, New Jersey), a publication that lists prominent & accomplished medical professionals.